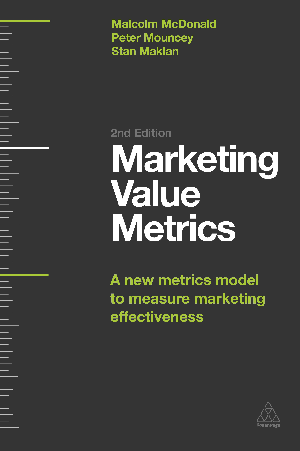 The Marketing Value Metrics model by Professor Malcolm McDonald, Dr Stan Maklan and Peter Mouncey of Cranfield School of Management was developed to help organisations improve the alignment between marketing activity and its impact on achieving corporate goals. This free chapter, from their recently released book Marketing Value Metrics (Kogan Page), briefly describes the key steps in the model and summarises the process for practically applying it. It also shows how marketing systematically contributes to shareholder value and identifies why it is important to ensure that functions other than Marketing within an organisation are fully engaged with marketing in model process to ensure that promises made to the market can be effectively delivered. Readers of this chapter will also benefit from a 20% discount off Marketing Value Metrics with an exclusive code (sent to you by Cranfield School of Management).